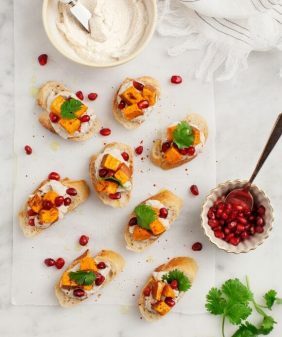 Crispy toasts topped with feta, sweet potato, sage, and cranberries make a perfect fall snack or Thanksgiving appetizer. Simple, delicious & vegetarian. It’s fall and I’ve been madly in love with this combo lately: roasted sweet potatoes, feta, dried cranberries, sage & honey. I like to think I’ve become more creative with my cooking since we started this blog (coming up on one year ago! ), but in the past few weeks, I’ve used those 5 ingredients in a slightly different form nearly every single night. I’ve tossed them with kale or spinach as a side dish… mixed them with wheat berries or quinoa for a hearty grain salad… I haven’t made a dessert out of them yet, but I wouldn’t say that’s completely of the question. If I had to pick, I’d say this crostini might have been my favorite. I just love how the sweet, salty, and tangy flavors work on top of toasty grainy bread. 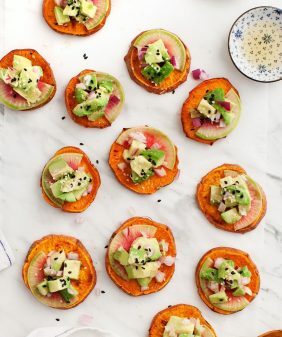 Roast the sweet potatoes: drizzle the cubes with olive oil, salt and pepper, cook in 400 degree oven for 15-20 minutes or until golden brown. Watch it a little closely, if you chop these small, they'll cook faster than you might think. Drizzle the bread slices with a bit of oil and toast them in the oven with the potatoes (about 5-10 minutes depending on your bread). When they're done, take the ½ garlic clove and rub the open side of the garlic on the toast. 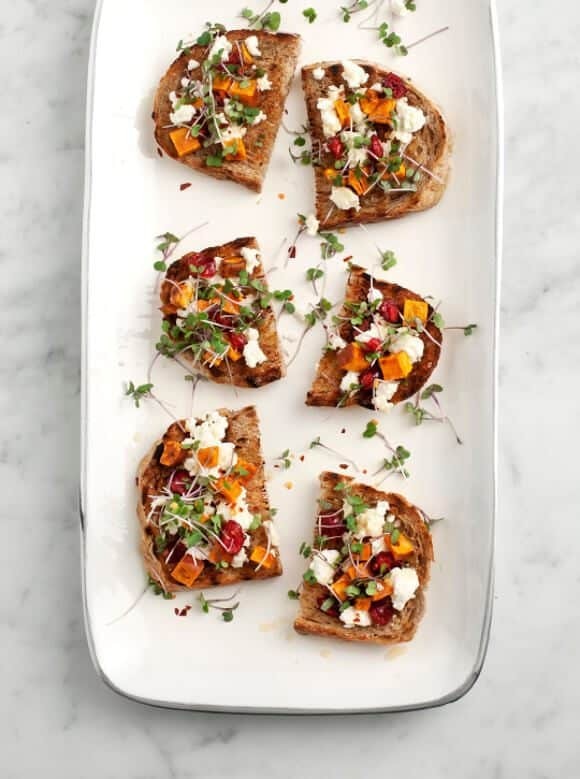 Assemble the toasts with sweet potatoes, feta, cranberries, and chopped sage. Top them with a generous drizzle of honey and some more olive oil if you wish. If you like, add a few micro sprouts and little pinch of red pepper flakes, and serve. What a gorgeous fall crostini! 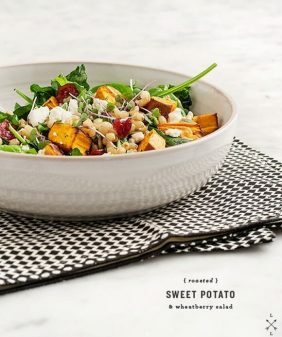 The flavours in this are just wonderful; I love that sweet potato and feta combination and when you add a touch of honey and the brightness of cranberries? Perfect. Love. This sounds so lovely! Great recipe! This sounds AMAZING!!! I love every component of this dish. YUM! Oh yum! I’ve been addicted to goat cheese too! Do you think that will taste right in place of feta? yes, it’s a combo that people seem to love, I can’t imagine you wouldn’t like it if you love goat cheese. Personally I don’t like goat cheese (I know..I’m in the minority), but love feta. Oh, what a great flavor combination for crostini! I love this combo too! Perfect fall combo! I want to toss it all together and put it in a twice baked sweet potato!!!! This combination sounds great-I think I’ll try it on a pizza! I love both feta and goat cheese, so I’ll try one on each side. Ok, the report–the pizzas were fine. Not fabulous, but fine, and the leftovers will get eaten. 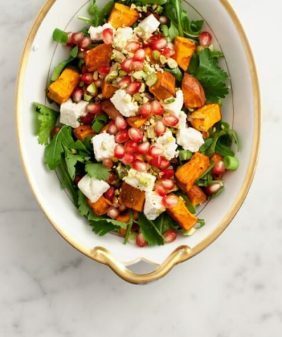 I loved the sweet potato with both feta or goat cheese, and I used thyme on one and fresh sage on the other, artichoke on one and onions on the other, but I didn’t add a dried fruit. Perhaps I should have. I need to consider a bolder sauce. Thanks for the inspiration! I think more of a flatbread might work better than a pizza… (grilling/baking the pizza dough first), adding a good drizzle of oil, and then adding the toppings so they’re more bold and fresh? The cranberries really add a pop of sweetness that really rounds out this combo (for me). This sounds so good and I’m going to make them for my husband’s surprise party this weekend. I do have a question however. I have a guest who is not a big fan of sage. Would thyme work instead? yep, I think thyme would be great! 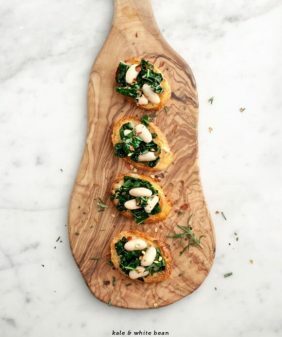 Oh wow, I love the flavour combinations in this crostini recipe 🙂 Looking forward to trying this! oh my goodness! I can’t seem to leave your blog! 🙂 I love this! 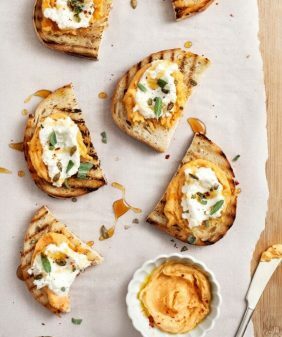 I absolutely LOVE crostini’s and love the sweet potato & feta combination! I just found your pretty blog….time to go straight to the supermarket and start cooking! THANK-YOU! Delicious! Made these for Christmas. Great combination of flavours. My boyfriend and I loved them and will def make again. Didn’t use micro sprouts/red pepper flakes to keep costs down, didn’t miss it to be honest. Also used dried sage instead of fresh sage. Hi Bettine, I’m so glad you both loved them!